Heller Search and BRM Institute are joining forces to educate the market about BRM, and promote effective BRM practices inside organizations. To learn more about this strategic alliance, click here. 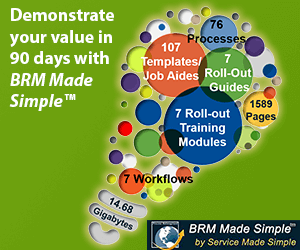 When paired together within an organization, TBM and a BRM capability work to elevate IT from the position of a cost-based service provider to that of a converged strategic partner and peer. To learn more about this strategic alliance, click here.